When you make a trip with the family to Disneyland, you expect to have yourself a magical time. Walking through those gates is not unlike walking into another world. However, some recent guests didn’t even make it inside when they found themselves transported to another land. In this case, Wonderland. 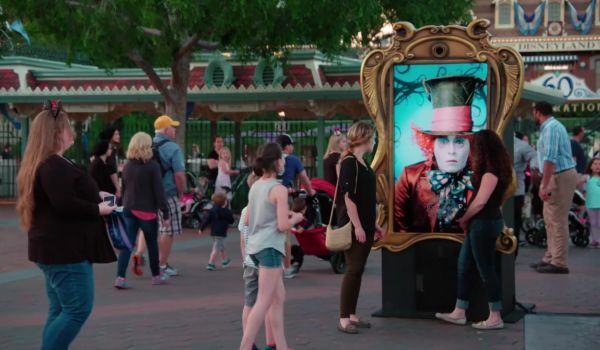 Johnny Depp made an appearance at the park in full Mad Hatter garb, though he did it in a fairly unusual way, streaming himself onto a movie poster. Check it out. As you walk onto the Disneyland property, you’ll find yourself in a large open plaza, with the entrances to Disneyland on one end, and Disney’s California Adventure Park on the other. Set up near the Disneyland gate (you can see the train station in the background) you find a little kiosk showing you various movie posters for Disney’s upcoming Alice Through The Looking Glass. Everything looks perfectly normal, until the poster blinks. Even when the movement starts, people don’t freak out too much. It’s obviously just video, rather than a static image, no big deal. Then it talks. Then it says your name. At that point, it might be time to freak out a little bit. Bonus points to Disney for leaving the woman’s F-bomb in there though. Even bleeped, it’s a fairly un-Disney thing to see. We approve. Watching this, it’s never 100% clear that the tourists interacting with the Mad Hatter even realize that they’re speaking with the actual Johnny Depp. It would be easier to believe they covered somebody else in make-up, who could do a reasonably good version of his voice. Yet, it actually is Johnny Depp. Why wouldn't it be? It’s just the sort of craziness that Depp's built his career on. Of course, just chatting with fans would never be enough for Disneyland. The highlight of the entire experience comes when the Mad Hatter sneezes, and the kiosk releases bubbles into the air from its top. The marketing stunt for Alice Through the Looking Glass certainly appears to have done its job. At various points, the crowds around the kiosk look enormous. We’ve got dozens of people jumping around at the command of a guy on a screen. From the looks of the changes in sunlight, it appears Johnny Depp spent a good deal of time entertaining fans, though we’re sure he took breaks. Spending time with the star of Alice Through the Looking Glass was probably not on the list of attractions anybody here was planning on doing, but we’re sure it made their trip to Disneyland memorable.